DON'T SKIP THIS SECTION. 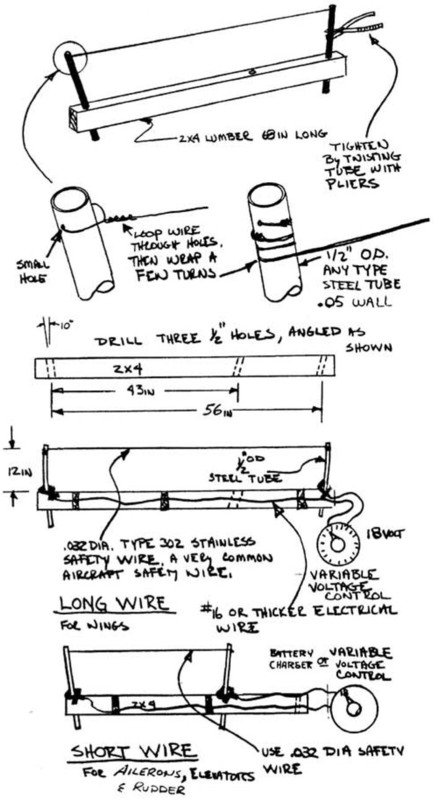 Every hour you spend in this preparation section will save you five when you really start building your aircraft. This section will teach you all of the techniques required to build your airplane, show you what special tools you need and how to use them. The educational samples that you will build in this section are designed to give you experience and confidence in all of the techniques that you will use in the construction of your airplane. The steps in construction of each sample are arranged in sequence (as are the steps in construction of the actual aircraft parts) and you should follow the sequence without skipping any steps. You will learn the basic glass layup technique used throughout the aircraft, special corner treatments, foam shaping, cutting, and joining methods. 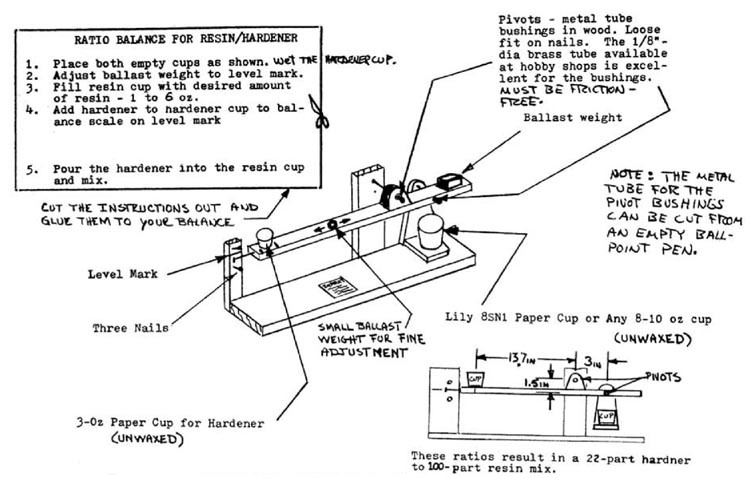 A summary of these techniques is provided on yellow paper for you to tack up on your shop wall. There are certain tools which are necessary to complete the aircraft. Three lists of tools are provided here. The first is the absolute bare minimum required, sacrificing efficiency; the second is a recommended list for the best compromise of cost and work efficiency; the third is a list for the “Cadillac” of shops where ease of construction is more important than money. The non-common items are stocked by the Quickie distributors. Dremel-type miniature high-speed hand grinder with saw and router bits. 12" long drill bits - #10 & 1/4"
* Weights are used to hold various parts down while epoxy cures. They’re bear in 5 to 15—lb pieces. The items in the photo work great. We got them for 5¢/lb at a local scrap yard. Sand filled milk cartons also work well. These are required in many areas during construction and for finishing. You may also use a “soft block,” which is a block of the blue styrofoam wrapped with sandpaper. Alot of elbow grease is saved if you replace the sandpaper often. This is not absolutely required, but is quite handy when jigging or checking the straightness of flying surfaces. it is merely a 6-ft or 8—ft lx3 or 1x4 piece of lumber that is hand-selected to be “eyeball straight.” You can get it one of two ways: (1) Order it from Aircraft Spruce or Wicks - they plane them perfect from dry lumber. (2) Sort through the lumber (dry fir or redwood) at your local lumber yard until you find one that looks straight when you eyeball it from one end. Mark it and hang it on the wall so it doesn’t end up as part of a shelf! Devices which automatically ratio the correct amount of resin and hardener and dispense it with the pull of a lever are available from VariEZE distributors for approximately $130. These save time and epoxy. 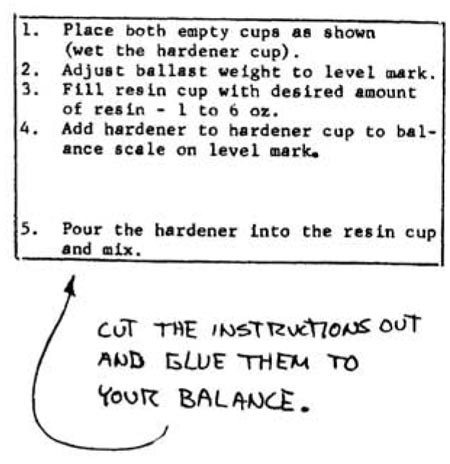 You can ratio the epoxy the way we did in building N7EZ and N4EZ by building the following simple balance; Cut out the 5-step instructions and glue to your balance - don’t skip steps! 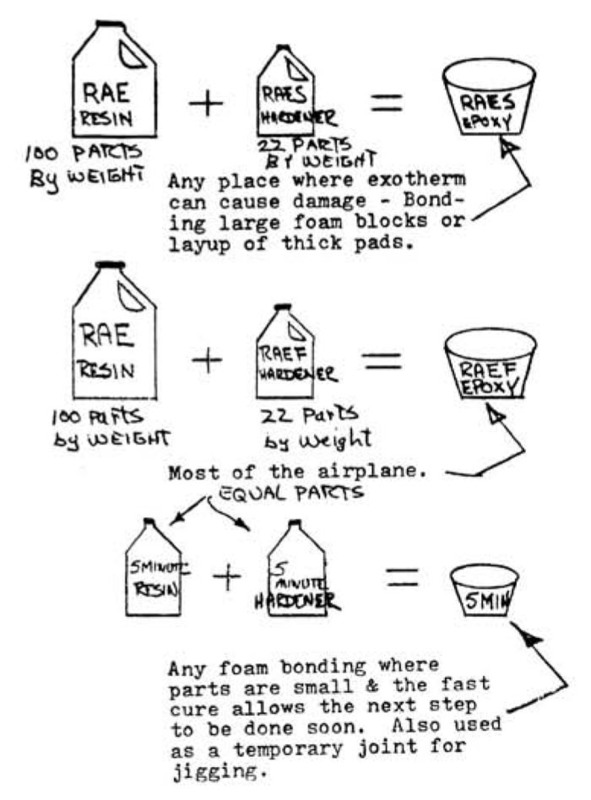 Follow each step exactly every time you mix epoxy. UNI cloth has 95% of the glass volume woven parallel to the selvage giving exceptional strength in that direction and very little at right angles to it. BID is generally used as pieces which are cut at a 45—degree angle to the selvage and are laid into contours with very little effort. BID is often applied at 45-degree orientation to obtain a desired torsional or sheer stiffness. UND is used in areas where the primary loads are in one direction, and maximum efficiency is required, such as the wing skins and spar caps. Multiple layers of glass cloth are laminated together to form the aircratt structure. Each layer of cloth is called a ply and this term will be used throughout the plans. Marking and cutting the plies of glass cloth is a job that you will repeat at often in the construction of your Quickie. Glass cloth should be stored, marked, and cut in a clean area with clean hands and clean tools. Glass contaminated with dirt, grease, or epoxy should not be used. A clean, smooth surface is needed for marking and cutting. The area used for storing and cutting glass cloth should be separated from the aircraft assembly area because it will be exposed to foam dust, epoxy, and other things which can contaminate the cloth. You will need a good sharp pair of scissors, a felt—tipped marker, a fairly straight board, and a tape measure for marking and cutting. The small amount of ink from marking and numbering plies has no detrimental effects on the glass cloth. In each step the size, type, and fiber orientation of each ply is given. Take the list to your glass cutting table, roll out a length of the appropriate cloth, straighten the selvage, mark all of the plies, and cut them. Now is a good time to stop reading long enough to go and cut a square ply of BID and see how easy it is to change its ahape by pulling and pushing on the edges as shown in the sketches. Cut a square with the fibers running at 45° and pull on the edges to shape the piece. It helps if you make fairly straight cuts but don’t worry if your cut is within 1/2 inch of your mark. As you cut BID it may change shape, just as the square ply that you are experimenting with does when you pull on one edge. Plies that distort when cut are easily put back into shape by pulling on an edge. Rolling or folding cut plies will help keep them clean and make it easier to maintain their shape. If several plies are called for, it may help to number them before cutting. Save your clean scraps and make an effort to use them for smaller plies. If the cloth is spotted with epoxy, throw it away. When cutting long strips or large pieces of 45° BID, always roll or fold it so it keeps its shape when handled. When it’s applied it can be set on one end of the part and rolled onto it. If you pick up each end, it will distort and not fit the part properly. The fiber orientation called for in each materials list is important and shouldn’t be ignored. 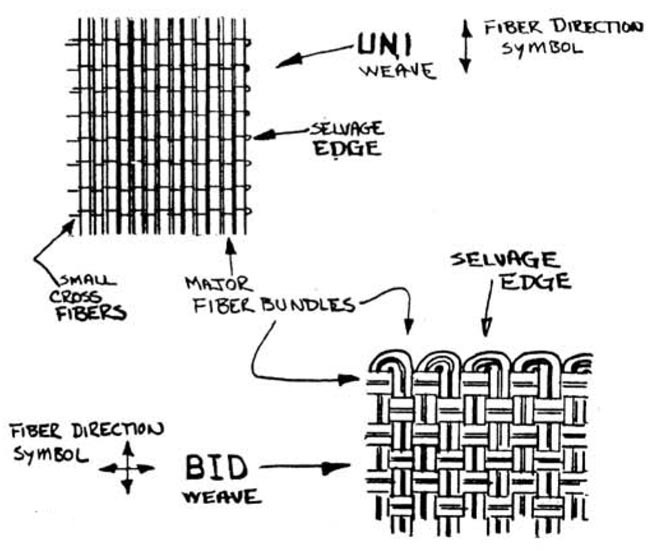 UNI is characterized by the major fiber bundles running parallel to the selvage and being much larger than the small cross fibers which run at right angles to the selvage. In BID the cross fibers are the same size as those running parallel to the selvage, giving BID an even “checker board” appearance. 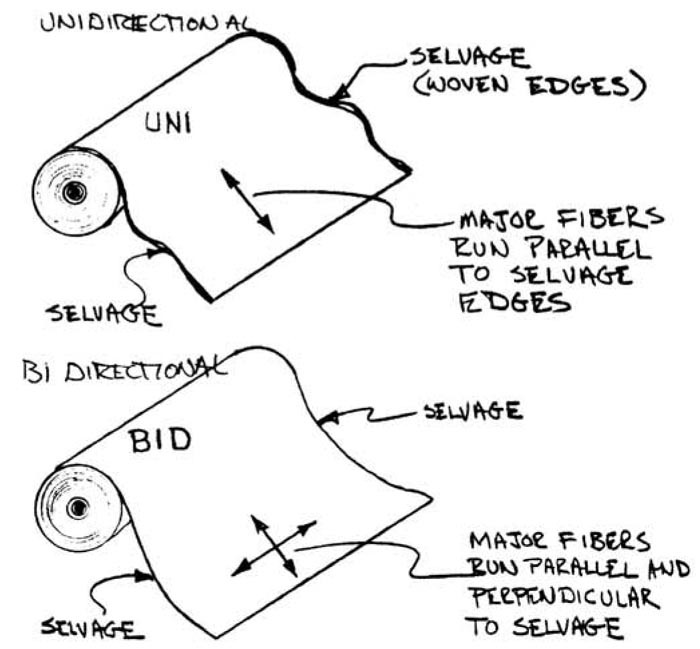 BID is commonly used for piles cut at 45° to the selvage. Your tailor would call this a "bias" cut. The 45° cut makes it easy to work wrinkles out of a ply locally, without having to chase it to the far edge. The 45° cut also makes it possible to make a ply slightly longer than originally cut by pulling on the ends or wider by puiling the sides. The 45° orientation isn’t critical; you don’t need to measure it. Your eyeball of a rough diagonal (45° ± 10 ) is adequate when either cutting or laying up the cloth. In recent years the term “epoxy” has become a household word. Unfortunately “epoxy” is a general term for a vast number of specialized resin/hardener systems, the same as “aluminum” is a general term for a whole family of specialized metal alloys. Just as the “aluminum” in the spar of a high performance aircraft is vastly different from the “aluminum” pots and pans in your kitchen, the “epoxy” in your Quickie is vastly different from the hardware store variety. Epoxy is the adhesive matrix that keeps the plies of load-carrying glass cloth together. Epoxy alone is weak and heavy. It is important to use it properly so that the full benefits of its adhesive capability are obtained without unnecessary weight. A large portion of your education in composite structural work will be spent learning how to get the full strength of an epoxy/glass mixture with the minimum weight. This section will discuss the terminology and techniques for working with epoxy resin and its hardener. An “epoxy system” is made up of a resin and a hardener tailored to produce a variety of physical and working properties, The mixing of resin with its hardener causes a chemical reaction called curing, which changes the two liquids into a solid. Different epoxy systems produce a wide variety of solids ranging from extremely hard to very flexible, Epoxy systems also vary greatly in their working properties, some are very thick, slow pouring liquids and others are like water. Some epoxy systems allow hours of working time and others harden almost as fast as they are mixed. A single type of resin is sometimes used with a variety of hardeners to obtain a number of different characteristics. In short, there is no universal epoxy system; each has its own specfic purpose and while it may be the best for one application, it could be the worst possible in another use. The RAE-type epoxy systems used in the construction of your Quickie are tailored for the best combination of workability and strength, as well as to protect the foam core from heat damage and solvent attack. These systems are also low in toxicity (SPI-2) to minimize epoxy rash. These epoxies are not similar to the common types normally marketed for fiberglass laminating. Three different systems are used in the Quickie, for three different types of work: a slow curing system, a fast curing system, and a 5-minute system. 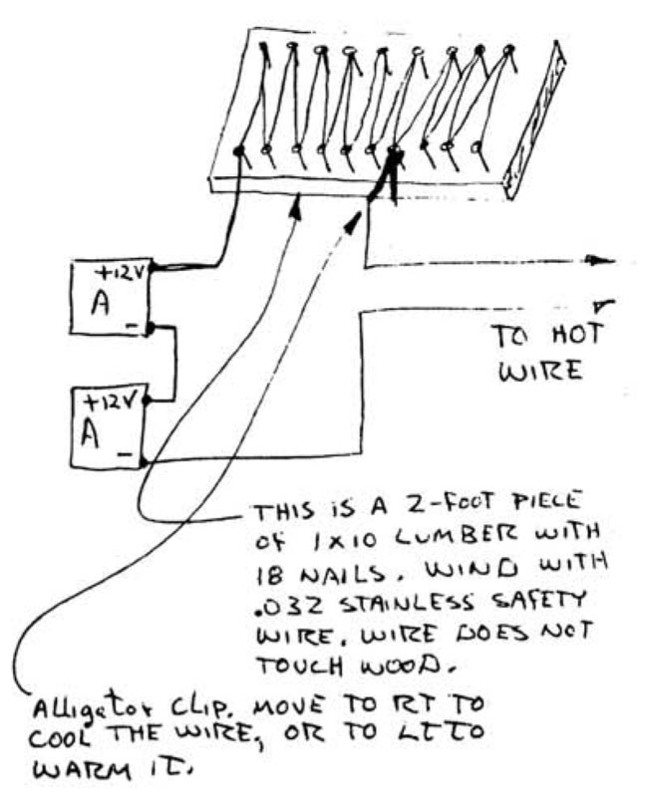 The very fast curing (5-min) system is used much like clecos are used in sheet metal construction (or clamps in woodwork) for temporary positioning. Five-minute is also used in some areas where high strength is not required, but where a fast cure will aid assembly.